This article is comparing the Portland Bee Balm to similar products on the market. This includes several other beeswax based lip products from both small and larger companies. These products are all organic and mostly made with local ingredients. We are comparing each product on several things including pricing, quality, and user experience. This balm is made by a couple who truly love bees, and want to further beekeeping in their area and beyond. The design of the packaging and lip balm inside will also be a part of our review. It will tie a final note on each product to the overall company philosophy on things like sustainable practices and the environment. What is Portland Bee Balm? Portland Bee Balm is the brainchild of long time beekeepers Brad and Anika Swift. The pair raises bees in their S.E. Portland home. Brad grew his love of honey into a very natural product. He also helped to create the display cases from another thing he loves, woodworking. Unlike other companies that use plastics on paper labels with many chemicals, they even make sure they make their labels from non-processed wood pulp. Constructed from bamboo, this little house weighs 2.88 pounds and measures 4.5 inches in width, 5.5 inches in depth, and 8.8 inches in height. To protect the bees they raise and support local bee communities, the pair set out to make the smallest carbon footprint while making one great lip balm. They also have a sister candle business that uses beeswax too. With both companies, they have taken great steps to be earth-friendly. This business grew out of a DIY project in their backyard. They still hand make each batch of lip balm. This company prides themselves on taking the best care of their bees and educating others about the role bees play in the larger world. They are not raising bees just to make the products, but instead, the product grew out of their love for beekeeping. Prices for the balms start at about $13 for a pack of 3 balms on either the peppermint or unscented kind per tube. The balm that also includes sunscreen. For customers wishing to buy a case of 20, the price drops to about $48. There is also an option to buy a case of balm with personalized labels for about $60. To buy the personalized tubes, there is a minimum purchase of two cases. They also offer special pricing for wholesale orders and those wishing to buy the lip balms for resale. Resellers can also buy one of several unique wood display units that highlight the natural wood texture of their labels. The details of the label add to the product. Customers can buy these products directly from their online store or at a wide range of local food co-ops in Oregon, Washington, Texas, Illinois. Ohio, Florida, Michigan, California, New Mexico, Colorado, Utah, Idaho, Missouri, Oklahoma, Montana, Kansas, Nebraska, Arizona, Alaska, and New York. It concentrates the biggest concentration of stores that carry in Washington and Oregon. They offer an online store locator to connect customers to retailers. They make this lip balm in Hawaii on a holistic bee farm. They flavor the balm with raw honey and organic vanilla. There are hints of Stevia to make it even sweeter. The base of this product is beeswax with pollen and propolis. There is also an organic olive oil used in the product. While this product has more of the smell and taste customers might expect from a wax-based balm, there is also something unexpected. There is a significant price jump for this product from the Portland Bee Balm. The price jump did not seem to match the slight difference in product from the Portland Bee Balm. The value was missing from this product. This lip balm is part of a larger skincare line from this company. Customers can find the products on the company website and online sources like Amazon. The bee farm that makes the wax focuses on the strength and overall natural health of the bees. They know them for raising unique bees and a sweeter honey. The bees are also more robust. Like the product out of Portland, this line also focuses on local sourcing. It is made in small batches as well. It is not clear if they also use alternative labeling processes like the Portland beekeepers. The focus here is on the bees mostly so the change in labels may not be a priority. They share the love of beekeeping and bees with the beekeeping Swift family. They also make this product by Toms of Maine of organic ingredients. The mix is more extensive than the first two balms, a few of the ingredients have a slight aftertaste. The base is still natural beeswax, this time organic cera alba. Organic coconut and peppermint oil add to the mix. Something different in this balm that can be offsetting is the addition of organic corn mint oil, which is a menthol. It also has both soybean oil and sunflower seeds. While some customers like the tingling feeling of the menthol, others do not. This product seems to have an overall stronger smell than the product from Portland. This product is readily available in most cities at places like Target, and Trader Joes. They also sell a full range of natural skin care and body care items online. Toms of Maine uses a less sustainable label for the mass distribution products. They also do not seem to have as much direct contact with customers and look more like an item a store regularly stocks instead of a specialty product. It is interesting to note that this product is the same cost as the smaller batch products out of Portland. Because they are in so many stores, this brand has solid customer recognition that a smaller company will not have. They are a trusted brand with loyal customers. They are well-known for natural products but also widely available in mass markets. There seemed to be something lacking in the lip balm from Badger Balm. While they sell it as being unscented, there is a faint smell of generic nut and maybe even a small hint of spice. There is a scent, and it is nothing near the other sweet lip balms. This product compares to the unscented version of the Portland Bee Balm. As with the other products, beeswax is also the base of this balm. This lip product also contains olive oil like the others. There is also caster seed oil and rosemary leaves. The USDA has certified the entire product to be organic. This formula has added antioxidants the others did not have. The products are not as common as Toms of Maine but available in many retail outlets nationwide. 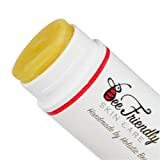 This lip balm joins a full range of products that include gluten-free body care products, organic massage oils and skin care for the whole family. 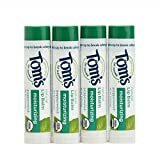 While this company is larger than the Portland-based lip balm maker, they still connect directly with the growers they buy ingredients from. They are also committed to sustainable products and no animal testing. Their focus is on using the best botanical ingredients grown without chemicals or pesticides. Badger Balm also brings science into the mix as they are not focusing on the bees per se, but instead the mix of botanicals. While they make the product with beeswax, this is not the focus of the brand like some other companies. Bees are not their passion. 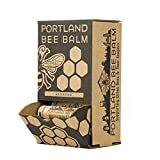 After comparing the Portland Bee Balm to others in the market, this balm has several great things going for it. The first being their use of the alternative labels that do not use harsh dyes or treated pulp. The wood-like feel of the label adds to this product. This company also tries very hard to make a minimal carbon footprint by even going as far as using natural inks on the labels and hand making displays out of wood instead of plastic. This attention to detail is best seen in the local markets of the Pacific Northwest. There is a hope that this product will make it into as many stores in each state they have already hit in Oregon and Washington. Pricing for this product is low for the market. There is also extra value in the small batch production and being able to have them made with customized labels for special events. This feels like a high-end product without the cost. They support the high-end feel with the attention to detail this company pays to their displays. These items are not simply thrown on a shelf. Retailers have the option of using handcrafted display unis that match the wood feel labels. This is one way they set themselves apart from the other products. The peppermint flavor added to one kind of the balm is enough to add interest without being overpowering. The Toms of Maine got to be too much with the added menthol. It also seems they use a larger volume of peppermint. The low cost per tube ends up with this product getting a 5 star rating. Not only does this product fit nicely in the overall Portland vibe, but it also is affordable for the average customer. The Portland Bee Balm has several great things going for it at an affordable price. Their use of alternative labels doesn't use treated pulp or harsh dyes. It has a good wood-like design and the manufacturer is dedicated to using natural inks on their products. Also, the smell of the product isn't too strong. Overall, we are giving this balm 5 stars out of 5. Previous articleWhich Class Do Honeybees Belong To?